With the warmer weather finally (hopefully!) on the way we can look forward to al-fresco dining and delicious, healthy salads. Violife has developed a mouth-watering Greek White Block vegan to chop up with crispy salad leaves, kalamata olives and sweet cherry tomatoes for the ultimate Vegan Greek Salad (see recipe below). The perfect alternative to dairy cheese, this coconut oil based powerhouse provides 30% *NRV Vitamin B12. As with all Violife products this plant-based beauty is deliciously tasty so it is ideal for use at gatherings with friends who have different dietary needs, in fact perfect for anyone wanting an indulgent tasty snack without the cholesterol or common allergens of dairy cheese. Violife is 100% vegan as well as being free from common allergens lactose and gluten, it is soy and nut free with no GMO. This means that it’s not only vegans who can enjoy the range but people with intolerances, allergies or coeliac disease. In fact anyone looking to include some cruelty-free alternatives into their lifestyle will enjoy this new product. 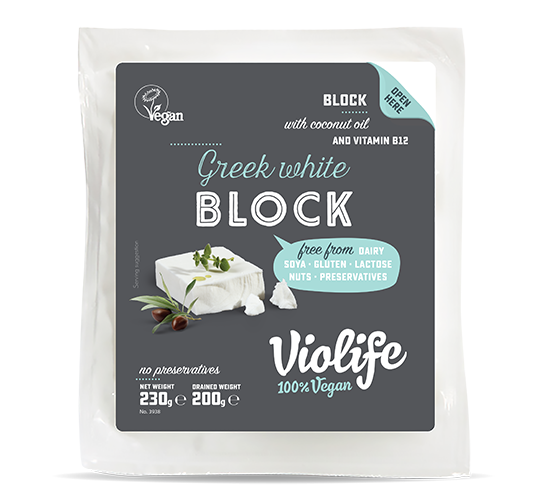 Violife Greek White Block products can be found at most independent health stores priced at between £2.49 and £2.69. Violife makes it possible to feed yourself and your family all the foods you love, from pizza and mac & cheese to the ultimate comfort of a great toastie. *Nutrition Reference Value according to EU regulations. The Violife team are a happy bunch of foodies based in the beautiful surroundings of Thessalonica in Greece. They’ve been dedicated to making amazing tasting, 100% vegan non-dairy, non GMO foods since the 90’s and we are proud and humbled to be a favourite brand for so many Vegans, Vegetarians and Flexitarians around the world. All their 100% Vegan foods are free from; lactose, GMO, gluten, nuts, soy, preservatives and cholesterol. So you’re guaranteed guilt-free and allergen-free eating! In a mixer blend together all the ingredients for the dressing. In a salad bowl add all the ingredients for the salad and the dressing, and mix thoroughly.